Image description: a four-generation family tree showing the genealogy of the main characters in my Kevarya Universe. If the world of fiction has taught me anything, it's that every high fantasy universe needs a cool fantasy map and an extensive genealogy of its big, screwed-up royal family. 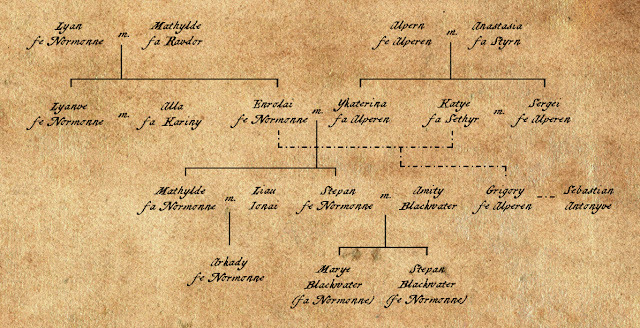 Since Kevarya is, at its heart, all about a big, screwed-up royal family, here is my attempt at a family tree, along with some entertaining anecdotes about various members who will likely have no impact on the actual plot of the novel. For a full-sized, actually readable version of the family tree, click here. Lyan & Mathylde fa Ravdor. Princess Mathylde fa Ravdor was the only child and heir of King Ivan fe Ravdor, the last of the royal dynasty that came before the fe Normonne. Lord Lyan fe Normonne married her in a lavish ceremony with a feast that lasted for three days, much to the annoyance of the servants that had to organize it all. Three years later, King Ivan died, naming Lyan as his successor. Lyan and Mathylde had two sons, Lyanve and Enrolai, although the Queen died shortly after giving birth to her second son. Lyan never took another wife. Enrolai & Katye & Sergei & Ykaterina. This was the royal scandal of its day. At his brother's wedding reception, Prince Enrolai fe Normonne courted and eventually seduced Katye fa Sethyr. Shortly thereafter, Katye was informed by her family that she has been betrothed to Sergei fe Alperen. When Katye’s quickening confirmed that she was pregnant with Prince Enrolai's child, Sergei was hurt, but since in Kevaryese culture, out-of-wedlock relations are less frowned upon if both participants are single and Katye wasn’t betrothed at the time she slept with the Prince, Sergei could and would not abandon her and the child. Sergei and Katye were married the next month. Prince Enrolai was invited as a courtesy but surprised everyone by actually choosing to attend. Sergei's sister Ykaterina smoothed over some of the awkwardness and became good friends with the Prince in the process. When Katye's son Grigory was born, Enrolai publicly acknowledged him as his illegitimate son, while Sergei adopted him as his heir. After two years of close friendship and mutual pining, Enrolai and Ykaterina became lovers. Not wanting to repeat his past mistake, Enrolai immediately sent a messenger to Ykaterina’s family asking permission to marry her before they betrothed her to someone else. Stepan & Amity. Prince Stepan fe Normonne, heir to the Kevaryese throne, met Lady Amity Blackwater at a ball during a two-month diplomatic visit to the neighboring nation of Galara. The two were drawn to one another, but unfortunately, Amity was already married to the philandering and neglectful Lord Braedan. 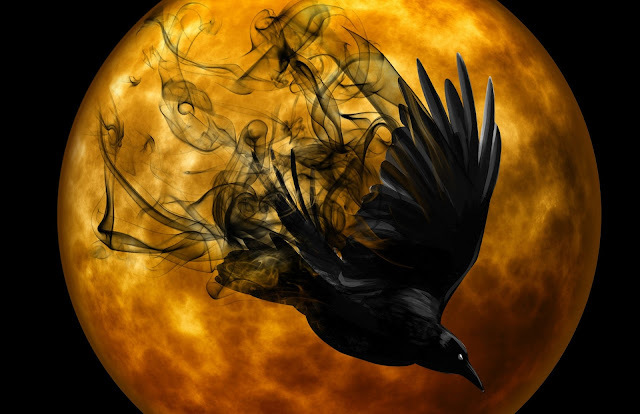 Days before he was meant to return to Kevarya, Stepan revealed that he had betrayed and poisoned his father. Galara granted him asylum, and so he stayed there as he waited for his chance to claim the throne. In the meantime, Stepan and Amity met frequently in secret and began plotting a way to get rid of Amity's husband and marry one another. On Braedan and Amity's five-year wedding anniversary, the lovers set up a trap to catch Braedan in bed with another woman. Stepan challenged the lord to a duel on the spot, and while the two fought, Amity snuck up from behind and killed both her husband and his mistress. Stepan then proposed to the newly-widowed Amity, who immediately accepted. They were married the next year, and Amity would become Stepan's most loyal and powerful ally in the civil war between the Prince and his sister King Mathylde. Thyld & Ionai. When Mathylde "Thyld" fa Normonne crowned herself King, she knew she would need allies, should her brother Stepan challenge her claim to the throne. Thyld met with the Empress of neighboring country Yenoui asking for military assistance. While the Empress refused to involve her own army, her military-minded cousin Liau Ionai volunteered to lead the Kevaryese forces, becoming general of Thyld's army. He and Thyld grew close in the years they spent battling Stepan, but it was only after Ionai was captured that the King realized she had fallen in love with him. After narrowly escaping a siege, Thyld and Sebastian, Ionai's second-in-command, lead a surprise attack on Stepan's prisoner-of-war camp. Thyld personally rescued Ionai, who had thought she was dead, and the two became engaged once they safely reached Yenoui. As part of Ionai's dowry, the Yenoui Empress provided Thyld with the money to buy enough weapons and supplies to revitalize Thyld's forces, and by the end of the next year, Thyld had won the war and married her beloved general.